Look at your modern-day road map in the area to the east of Thrunton Woods and you will pick up the prominent red trunk road that is the A697. It curves elegantly around the contours of the moorland thereabouts, avoiding all settlements of any size for several miles north from the village of Longframlington until the traveller reaches Powburn, some 11 miles distant. This mundane stretch of road has been redirected and relain over at least three different courses during the centuries and the evidence is easy enough to make out. First of all – or at least as far back as we are able to go – there is the Roman road, the Devil’s Causeway. Your trusty OS map will show you that this early thoroughfare danced either side of the present-day road in a characteristically straight line on its way from Tynedale in the south to Berwick in the north. For occasional stretches it actually lies under the A697 – most notably for a two-mile run north of Powburn. In time, of course, the road faded from view and out of use for the most part. In areas where it disappeared completely, new highways and byways were cut, linking the developing towns and villages. Actually, these ‘new’ roads were more often than not ancient tracks and drove roads which were revived and developed after the Romans left. 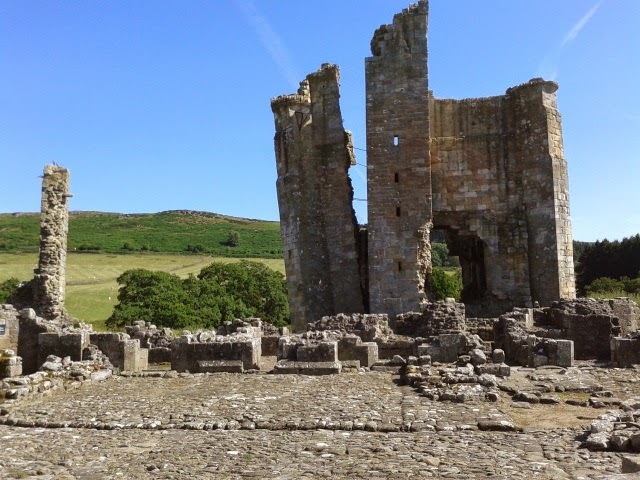 In our example, the ‘new’ route through the area took folk over the moors to skirt the eastern fringe of what is now Thrunton Woods, and onwards through Whittingham and Glanton, before dropping down onto the Roman road again near Powburn. This road still exists (for most of its route, anyway) as a minor backroad, being familiar to those of us who regularly visit Thrunton Woods for its woodland trails. As roads became evermore important for trade and commerce, so their generally poor condition became more and more of a concern. The muddy mess that was the Whittingham-Glanton route formed part of a major link between Newcastle and Edinburgh, especially after the opening of the bridge at Coldstream in 1767. Traffic increased (including the introduction of passenger and mail stagecoaches) and the roads deteriorated rapidly. In time, Parliament stepped in to force improvement with the passing of the Turnpike Acts. In about 1840, a decision was taken to build a new trunk road along the course with which we are familiar today. The A697, as it is now called, skirts away from Thrunton, Whittingham and Glanton, gliding unhindered through gentle moorland to the east. It then drops down through Crawley Dene to Powburn, where it meets up with its predecessors. The A697 has been tinkered with plenty since, but mostly just a little widening and considerable resurfacing. Its ‘history’, though, is still plain for all to see on the modern-day map. In the winter of 1847 – February, to be precise – workers found a small collection of Bronze Age artefacts which provide a shadowy insight into ancient Northumbria. 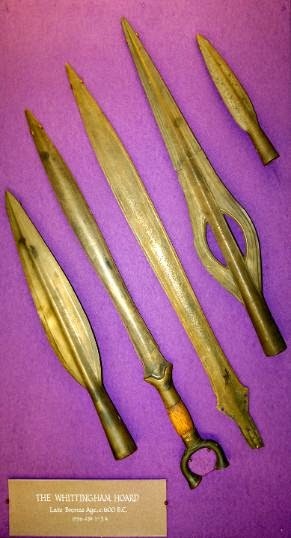 In a muddy field near Thrunton Farm a little to the SE of Whittingham, two bronze swords and three spearheads were found buried in the peat during drainage work – but in a strange upright, circular arrangement. The odd and quite deliberate grouping suggests a ritualistic reason for the deposit. What must, at the time, have been very valuable objects were surrendered by their owner(s) and offered up to the gods for reasons which we will never know. They date to around 550BC – the very end of the Bronze Age – and illustrate the quality of weaponry being used at this time. A horned pommel sword (above, second from left, and known as the ‘Whittingham Sword’) is a state-of-the-art, continental-style piece of kit and indicates interaction between the locals Brits and the European mainland. The hoard is now in the possession of the Society of Antiquaries of Newcastle-upon-Tyne and is housed in the city’s Great North Museum. A fair few places have a castle. A handful have two. But three? Well, the little village of Callaly on the edge of Thrunton Wood can claim just such an unlikely total of historic sites. Actually, if you count the original ancient hill fort, then the total if four. Five, in fact, if you include the 12th century pele tower which is incorporated into the current castle. The first site of interest is the lofty prominence known imaginatively as ‘Castle Hill’, the home of some earthy ramparts. This was once an Iron Age hillfort and was later adapted by the Callaly family in the 12th century. There is a school of thought which holds that this structure was never properly finished – perhaps due to a downturn in the family’s finances or an unexpected period of peace. Or, indeed, a supernatural event – see next paragraph but one. In between the Iron Age hillfort’s heyday and the 12th century refurbishment efforts of the Callaly clan, a Norman ‘motte and bailey’ castle may have been thrown up a little to the north of the village. Thereabouts can be found faint traces of earthworks and enclosures which indicate a temporary military presence, the spot once being known as Callaly Camp. Returning to Castle Hill, the Callaly family, having fiddled about on the mound for some time, seem to have eventually set up stall permanently at the current site a little to the west – essentially, the 12th century pele tower which was later incorporated into the present mansion (it may be a little younger and perhaps originally a little larger than a mere tower – theories vary). A supernatural version of events has us believe that the Lord of Callaly’s wife, unhappy at the family’s attempts to establish their stronghold on Castle Hill, resorted to having a servant constantly thwart the builders’ efforts with nightly destruction raids on the work. The cheeky chap in question, dressed as a boar, sent the staff into a superstitious frenzy – so much so that the Lord agreed to commence work at the current, more favourable spot. The substantial effort which we see today was constructed by the Claverings in the 17th century and added to periodically since. This handsome pile – the building we now know as ‘Callaly Castle’ and more of a country house in reality – is really rather magnificent. It is not, though, open to the public. I can’t easily provide any images without infringing copyright – but more info and some great pictures can be found here. Parish churches were for centuries the most substantial buildings in towns and villages across the land. Unlike the present-day, when these surviving structures are frequently dwarfed by later development, the local church stood tall and proud above all around. The feeling of awe these buildings generated helped the church as an organisation dominate the lives and minds of its subjects. But in times of unrest – especially in eternal warzones such as the English-Scottish border – these edifices frequently acted as places of refuge. Quite often, of course, God failed to save the frail and vulnerable – an extreme example being the massacre at Warkworth church in 1174 at the hands of the Scots – but, generally speaking, these stone strongholds must have come in handy at numerous, more minor, moments of danger. 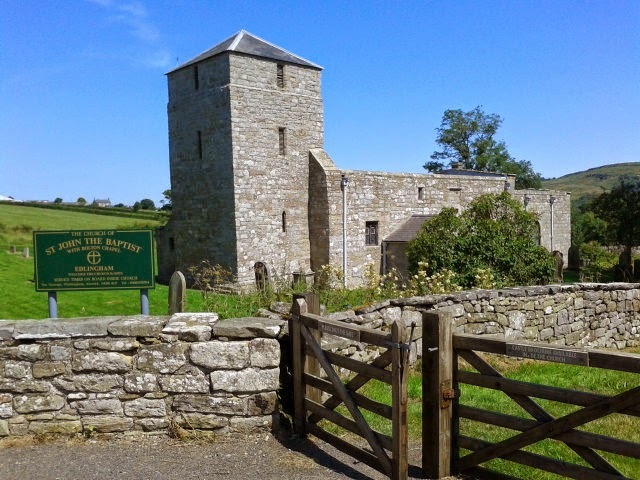 The towers and spires of many of Northumberland’s places of worship seem purpose-built for defence, but none more so than the bulky effort at Edlingham. The tower of St.John’s Church is straight out of a Roman architect’s manual, though is essentially a Norman-style church from the 11th and 12th centuries – the extraordinary tower being added in the 14th century. Its narrow, slit windows, slated pyramidal roof and general no-nonsense style make it a perfect sanctuary from any trouble (viz. angry Scots) that may blow in from the hills. Furthermore, barholes on the interior of both the porch and the inside of the tower provide evidence that the structure could be heavily barricaded to prevent entry – and you may have noticed, too, that the tower has no belfry openings.